Flip a coin until you get tails. This move does 30 Damage times the number of heads. Discard any Stadium card in play. 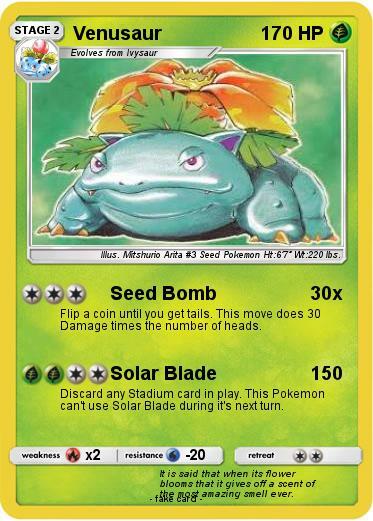 This Pokemon can't use Solar Blade during it's next turn. Comments : It is said that when its flower blooms that it gives off a scent of the most amazing smell ever. Illustrator : Mitshurio Arita #3 Seed Pokemon Ht:6'7" Wt:220 lbs.